Prism Medical UK were once again involved in an episode of DIY SOS: The Big Build, broadcast on 29th September at 8:00pm on BBC1. Alongside Nick Knowles and his team, Prism helped to totally transform the family home of Rachel and Andy Smith, from Derby. Rachel and Andy’s son Isaac suffered severe brain damage during childbirth. As a result, Isaac has life limiting cerebral palsy, and is totally blind. The family home and garden wasn’t adjusted to Isaac’s needs, causing a real strain for all the family. The DIY SOS team, alongside many volunteers and with the help of Prism Medical UK made a whole range of building adjustments and changes to help improve their living space, indoors and outdoors. 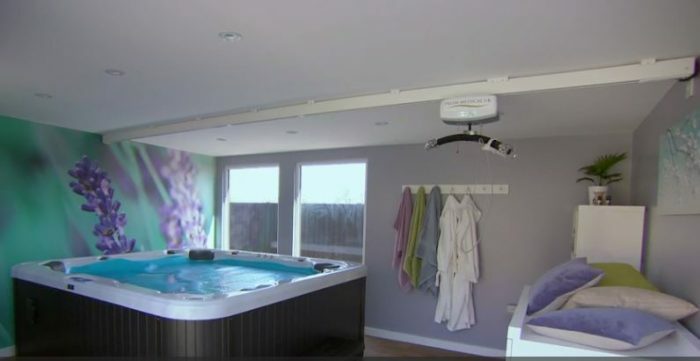 Prism were delighted to donate and install a Freeway TransactiveXtra ceiling track hoist system in Isaac’s bedroom and wet room. The family garden also took a dramatic transformation through a sensory landscape design and the construction of therapy hut, complete with hot tub. Prism also installed a ceiling track hoist system in the therapy hut. Both systems will really contribute to Isaac’s care, comfort and quality of life. ‘Our goal at Prism is to help people transform their lives, through the moving, handling and bathing solutions we manufacture and supply, and we are very privileged to have been involved and support the DIY SOS team throughout the build. Knowing we have made a difference to help Rachel and Andy, give Isaac the best possible life, is such rewarding experience, not only for those involved in the project, but for everyone at Prism Medical UK’.